I’ve been interested in this puppy since it arrived in my June LitJoyCrate, and even though I wanted something light and happy after reading “Final Girls”, I figured if I was already doing thrillers, might as well take this one on too. ha. I have had mild interest in reading tea leaves since Harry Potter and the Grim. Some of my favorite dialogue is between Harry and Ron as they make up predictions in their leaves. (You’re going to suffer… but you’re going to be happy about??) But after reading Outlander, I became even more fascinated. The Leaf Reader caught and held my interest right away as we follow Marnie and the leaf readings she does for the kids at school. 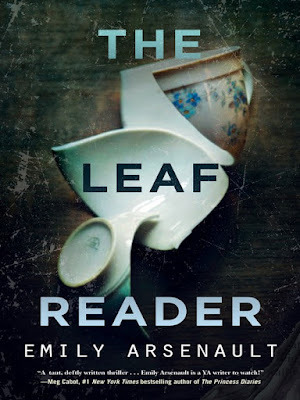 The explanations of the symbols and how leaf reading is done was super interesting to me, and I really enjoyed reading it. But this story starts taking a turn for the darker as one mystery after another begins to unfold in the leaves. I really liked Marnie. I liked her attitude and how she owns her weirdness. She was a good character to read about and I liked her voice. She was a solid character for me. The other kids involved with the mystery and the readings fell flat for me. I thought some of the descriptions about them or their behavior would have made more sense if they were fleshed out more. This is a super quick read. I read it in few short hours, and while there was a bit there in the middle where I wasn’t sure what exactly was going on or quite where it was going, it ended up coming together in the end. I could have read much more of this story and wished it were longer! If you’re looking for a quick, sort of creepy, but interesting read, and are also interested in Leaf reading or divination, I think this is your book.